In traditional histories of the novel, the last three decades of the eighteenth century normally receive far less attention than any of the seven before. 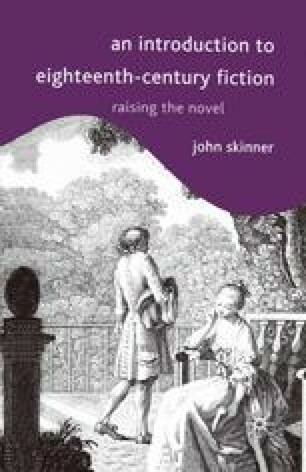 After its ‘birth’, ‘rise’ or ‘origins’ (tastes in metaphor vary), the novel seems to lose its appeal until the arrival of Jane Austen and the beginnings of a recognizably classic realist tradition. The main victims of this critical neglect have been the Gothic novel and the politically radical novel of the late eighteenth century; the most celebrated examples of each tendency are juxtaposed in the present chapter. It was earlier noted that, of the male proto-canon, Smollett had the longest fiction-writing career. Between Roderick Random (1748: a year before Tom Jones) and Humphry Clinker (1771: three years after A Sentimental Journey) there was an interval of twenty-three years; the literary and conceptual gap seems even greater. If one now moves forward another twenty-three years exactly, there is a striking literary coincidence. The year 1794 saw the publication of two epoch-making novels, superficially quite diverse, but with interesting literary parallels: Ann Radcliffe’s The Mysteries of Udolpho and William Godwin’s Caleb Williams.